The Gunnery is a heritage building on Sydney Harbour in Woolloomooloo, close to the Art Gallery of NSW, the Museum of Contemporary Art, and the galleries and colleges of East Sydney and Paddington. After extensive refurbishment by the NSW Government, the Gunnery opened in 1992. 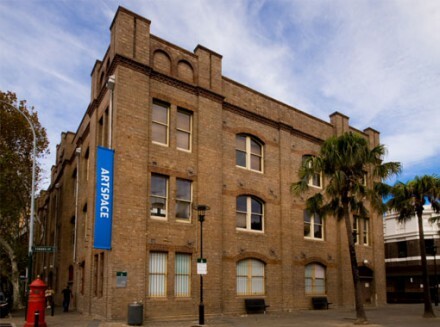 The Artspace Visual Arts Centre Is an international residency-based contemporary art centre. Through partnerships with peer organisations across Australia and around the world, Artspace enables exchange between Australian artists and their overseas peers. Each year Artspace presents gallery projects in its exhibition space on the ground floor, hosts artists’ residencies and initiates a range of public program and education activities. Artspace manages four residential and seven non-residential artists’ studios located on level 2 of the building. The studios are used predominantly for short-term accommodation and workspaces for international, national, and regional contemporary visual artists and craft practitioners. These residences are designed to provide subsidised access to studio facilities; facilitate professional development opportunities and enable artistic exchanges and interaction. More information on the residencies is available from Artspace.